"Doll wearing habit worn by Religious of the Sacred Heart of Mary"
Plastic doll is wearing a habit worn by the Religious of the Sacred Heart of Mary. Father Jean Gailhac founded the order in Beziers, France in 1849. The sisters are engaged in teaching. 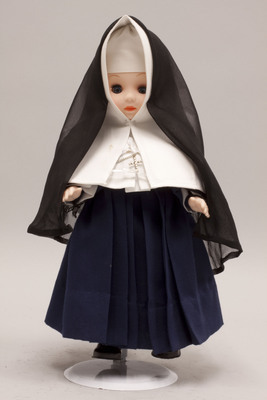 The doll is wearing a dark blue habit, white wimple,and black veil with white underveil fastened under the doll's chin. A metal cross hangs from a metal chain necklace around the doll's neck.